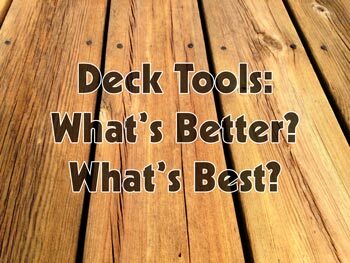 Deck Staining Tools: What’s Better, What’s Best? When it comes to applying stain or sealer to your deck, there are a wide variety of tools and applicators available. But which tools work the best? Which ones do the job quicker than anything else? Success on a deck project–as well as your overall experience–depends largely on the tools you use to apply the stain. Using the wrong tools can make the job more grueling than it needs to be. They can slow you down and prevent you from getting the stain on quickly and evenly. This can affect not just your experience, but also the quality and durability of the finished job. So, finding the right tools is important. Well, last year, we filmed a review video where we tested out most of the various application tools and techniques that we’ve ever heard discussed at RepcoLite. Some of these were recommended by employees and others are the “favorite” methods of some of our customers. Either way, we put all of these methods to the test and discovered very quickly that some of them are much better than others. In our tests, we found that the fastest way to apply the stain evenly and quickly was to roll it on with a standard, 9″ roller and then back-brush it using a Wooster Bravo Stain Brush. If you’re going to use this application method (and it’s the best! ), make sure you pick up 1 or 2 extension poles. You can attach the roller to the pole and apply your stain to the deck without leaving your feet. And, that’s why we recommend that particular Wooster stain brush–you can unscrew the handle and instead thread the brush onto the end of an extension pole. So you’ll be able to back-brush your deck from a standing position as well. Which is, (though I don’t have to say it), awesome. Alright, in our testing, there was a second method that we really liked as well: a Padco paint and stain pad. You can see it in the picture here, but just to clarify, it’s a six-inch pad with a handle that can be threaded onto an extension pole. The pad itself is a sponge with a bristled face. We found this tool to work very quickly and because the face of the sponge is bristled, it does not require back-brushing. It was as fast or faster than the roller and back-brushing method, but, there are two reasons we rated it second. First, it is not nearly as easy to stain the gaps between the deck boards when using this pad. 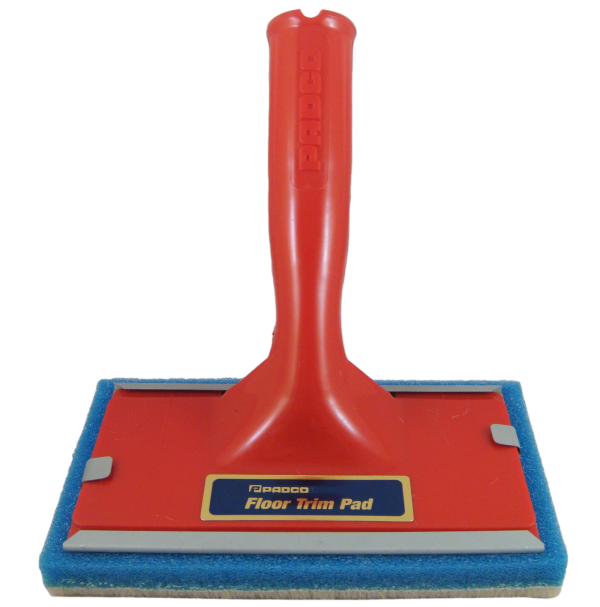 It works and can be done by turning the pad on it’s side, but it’s much easier to do so with the brush. Second, and more importantly in our consideration, the pad works best when the deck boards are in very good condition. If you have boards that are splintered, uneven, or rough, the pad doesn’t perform as well. It’s too rigid to conform to boards that have cupped over time (and you end up with spots that get no stain). It’s also a sponge pad that can be easily snagged and torn apart by boards with splintered edges. If you’re staining a new deck or a deck that’s in great shape, this is a very fast tool that you won’t be sorry you purchased. If the boards are less than ideal, definitely opt for the roller and brush combo we mentioned above! A third method we tested (and really liked) was the garden sprayer/brush combination. Basically, we took a conventional garden pump-up sprayer and used that to apply our stain to the deck. Now, a couple of clarifications. First, this only works for transparent or translucent stains–sprayers like this are not designed to spray stains with too much pigment. Second, this method can be… will be… messy! So, watch out for overspray on your siding, on your house, on your feet, and so on! However, if you can take care of all of those issues, then this is a tremendously fast method for applying stain to your deck. Just remember that as was the case with the roller, the stain still needs to be backbrushed to work it into the wood. And there you go! RepcoLite’s top 3 methods for applying stain to your deck. And if you’d like to check out our full review (and first video–so be kind to the dopes on camera), we’ve conveniently placed it just below this sentence! How Do I Clean an Old, Gray Deck? Have you heard about or tested the DECK BOSS by Perdura Pro Series Brushes? We have been in the professional wood and deck restoration industry and all our crews use the DECK BOSS and RAPID STAIN brushes which provide the fastest and most professional job. The DECK BOSS saves our guys lots of time as they can load up and back brush in the one motion while standing up and on smooth or rough material. It gets between the cracks and is fine for oil and water based coating/stain systems. These brushes are easy clean and last us a very long time so we don’t have to replace out very often. Our guys can literally be in and out from a job in almost have the time compared to a spray/back-brush or roll/back-brush method. I believe they are sold throughout the USA via Amazon.com and there are a few distributors/dealers as well. Would be great to see you guys doing a review of the DECK BOSS. Thanks again for your video. I watched this video before starting staining my deck, and it helped me a ton. Thank you, and i appreciated the humor along the way too! For the 9″ roller what nap do you recommend ? My deck is Cedar wood. Hi Orlando! We’d recommend a 3/8″ roller cover at most. You could use a Pro-Dooz from Wooster. That would be great. Don’t choose a very long-napped cover. It will carry too much product and make application a mess! And remember to be sure to back brush it! 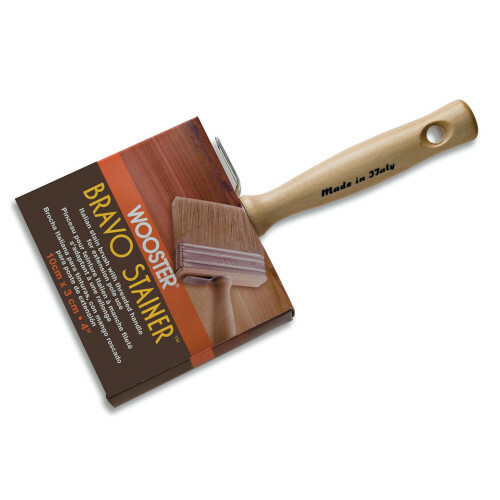 We STRONGLY recommend the Wooster Bravo Stain Brush. You can attach it to an extension pole and brush the stain into your deck without bending over! It’s awesome! When dealing with edges/siding that will be covered with painters tape, do I edge the sides first or will it dry uneven? If I’m understanding the question, you wouldn’t work around the deck and “cut in” as you would around a room. If you do that, you will likely have overlap marks. Instead, just work down the boards length-wise. Coat one or two full boards the entire length of the deck. Then work back. Does that help?